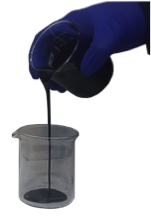 The objective of JetShear is to change or modify the structure of bitumen and heavy oil to reduce viscosity and improve its value with almost 100% volumetric yield. JetShear uses low severity, hydrodynamic cavitation and mild thermal cracking to structurally modify asphaltene molecules by separating resin groups attached to the asphaltene core. The rapid change in pressure allows microbubbles to form around nucleation sites. Kinetic energy from cavitation, converts to chemical energy and modifies heavy oil microstructures and the state of aggregation. The resulting de-structuring lowers viscosity and bulk density with essentially no change in the volumetric yield.